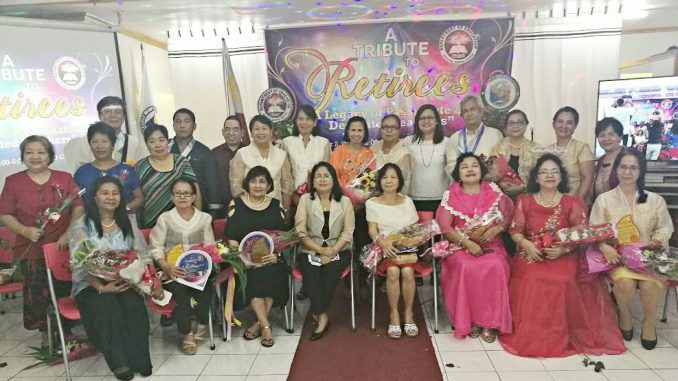 Division of Pasay paid tribute to 39 teacher- retirees from elementary and secondary schools on October 2, 2018 at SDO, Conference Hall. Wearing their Filipina and party outfits, the retirees painted a smile on their faces with the remarkable experience given by the Division. The event was signalled by the entrance of the retirees with their escorts. While walking on the red carpet, their photographs are flashed on the screen with a caption of their years in service and the schools where they served as teachers. In the opening remarks delivered by Dr. Melody P. Cruz, OIC-Assistant Schools Division Superintendent, she recognized the presence of the retirees as well as the efforts of the people who made the activity possible. The words to ponder were delivered by Mrs. Aurora Delminguez, retired OIC-Head Teacher of Pasay City East High School and Mrs. Marlyn Canizares a retired Master Teacher II of Marcela Marcelo Elementary School. In their messages they reminisced the challenges they encountered and the learnings they gained from their superiors, co-teachers as well as their learners. They expressed appreciation for the rare opportunity and the good memories given to all retirees by the Division through the tribute. The program commenced with a salute to the teacher-retirees for their greatness as stated by Mr. Libardo F. Torres, Chief Education Program Supervisors in his closing remarks. The tribute to the retirees is one of the activities in observance to the celebration of the Division World Teachers’ Day.